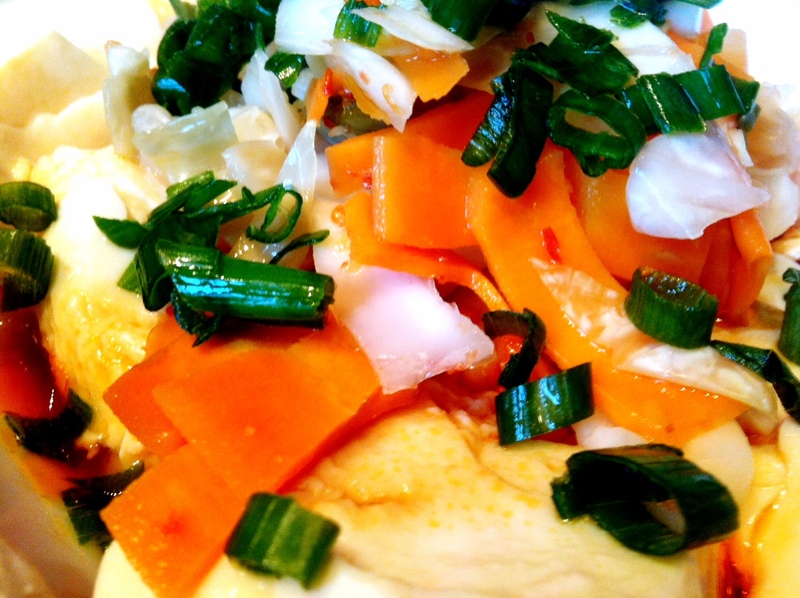 One of my favorite things about cooking is the opportunity to fuse ethnic dishes. 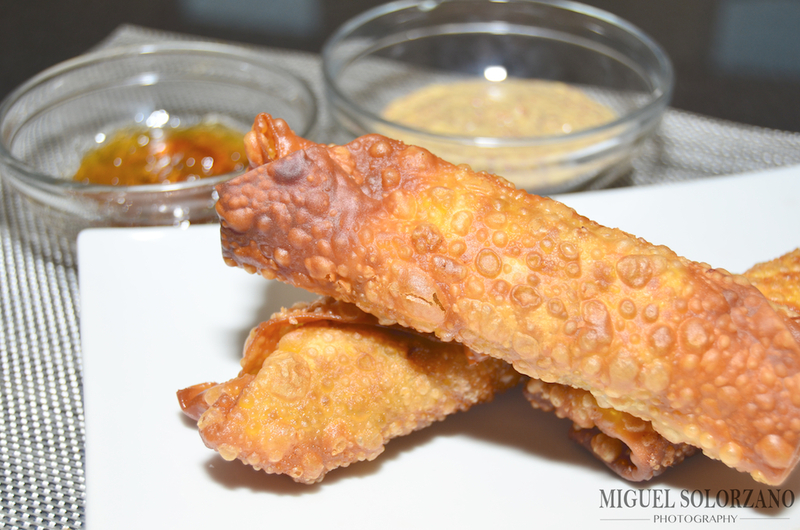 In this case, it’s the Chinese egg roll and Cajun boudin into Boudin Egg Rolls. I call it Casian cuisine. And man, are they good. I used boudin straight from Lafayette, but the store-bought kind will probably work as well. In my opinion, the smokier you can find, the better. In a Dutch oven or other heavy-bottomed pot, heat oils to 350F over medium-high heat. Remove the boudin from the casing. Finely chop up casing and add to boudin. NOTE: Adding the casings back in is optional. Place 2 TBSP boudin in center of each egg roll wrapper. Wrap from bottom up and then fold the sides in and top down. Fry until golden brown on all sides. 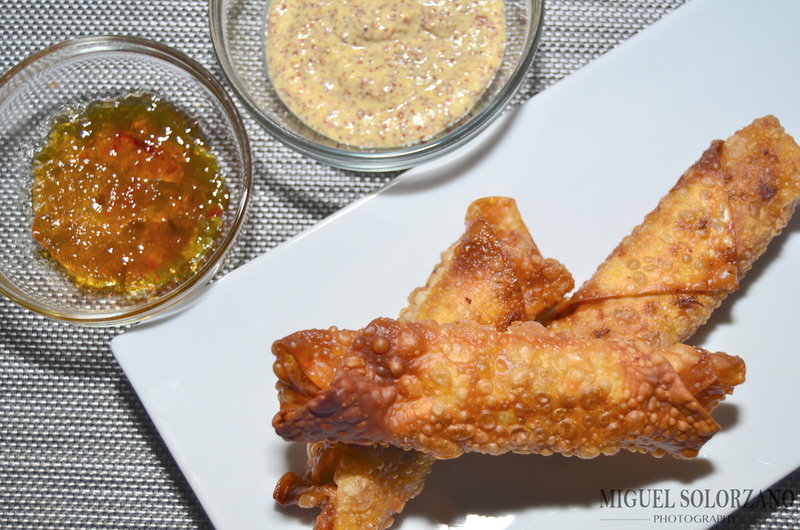 Serve with Creole mustard and/or pepper jelly as dipping sauce. 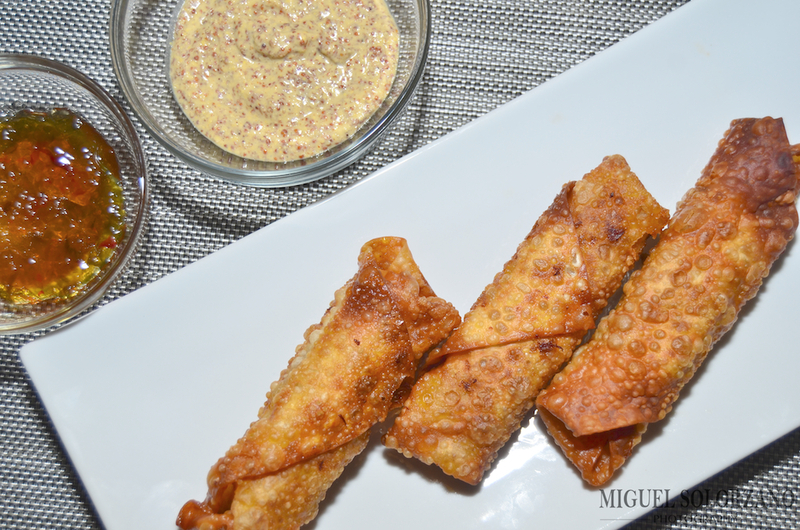 These Boudin Egg Rolls were surprisingly simple to make. There’s not much assembly required once you get the hang of rolling the egg rolls. I will definitely be adding these Boudin Egg Rolls to my tailgating cuisine repertoire. They are perfect to grab, dip and go. They may just be one of my new favorite appetizers. Hands down, Bone Marrow on Toast with Goat Cheese and Black Pepper Fig Jam is one of the best appetizer recipes I’ve yet to create. 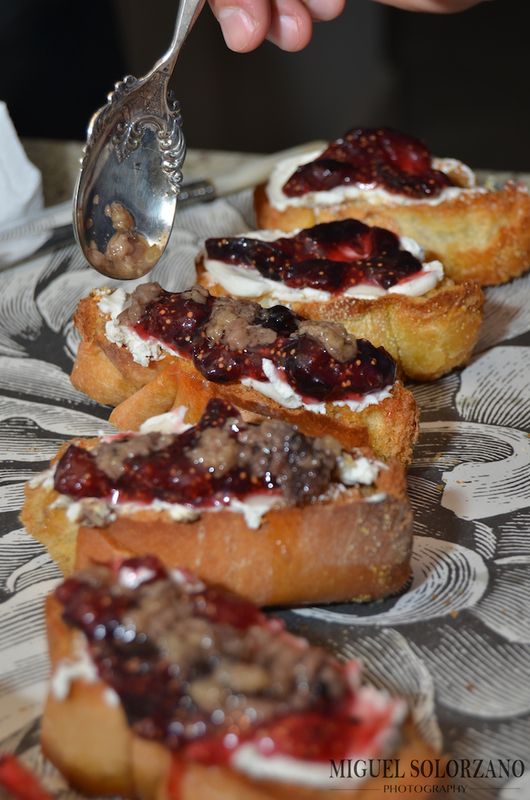 I also call it Blood and Bone Toast for short so it may make a nice addition to an adult Halloween appetizer spread. This recipe may look like a lot of work, but it’s surprisingly easy to prepare. On a large baking sheet, stand bones up vertically and roast for 20-30 minutes or until marrow is melting inside the bone. While bones are roasting, in a small pot, melt butter then add all Black Pepper Fig Jam ingredients. Bring to a boil and let simmer on low for 20-30 minutes. 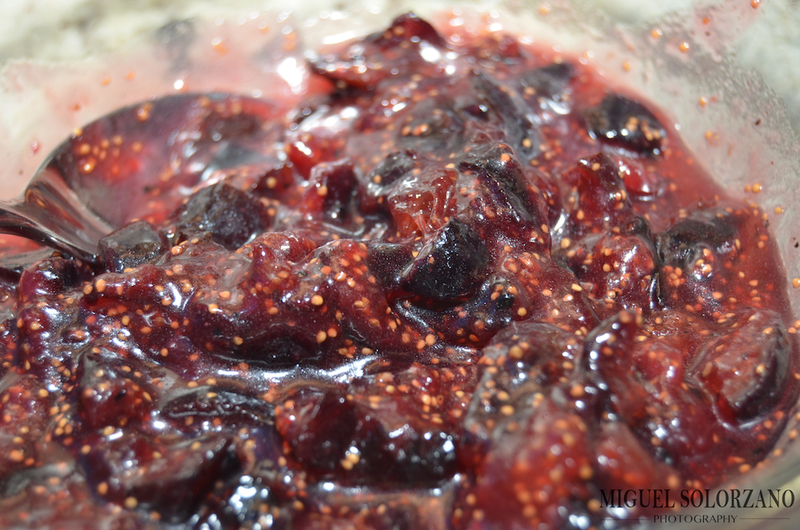 Remove fig jam from stove and refrigerate to let cool. Remove bones from oven and on a separate baking sheet, arrange bread pieces in a single layer and toast for 7 or 8 minutes. 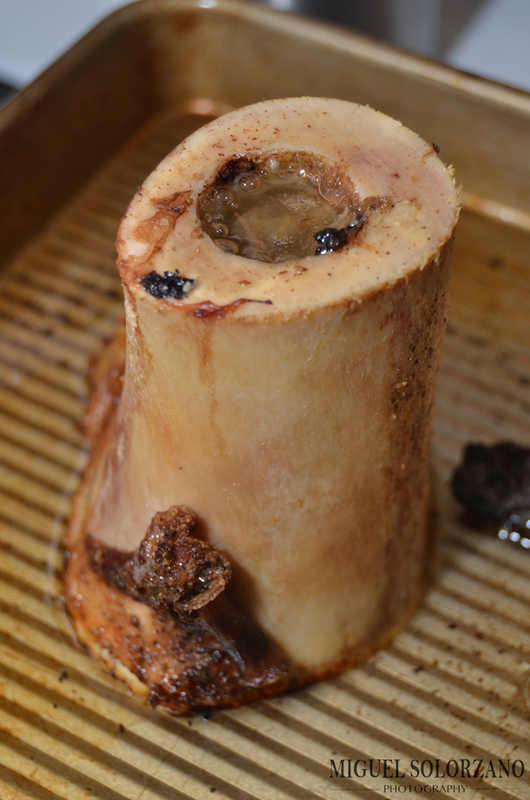 While bread is toasting, over a bowl, remove marrow from bones by using a kitchen knife (the narrower the better) to push or scoop out the marrow from the bone. 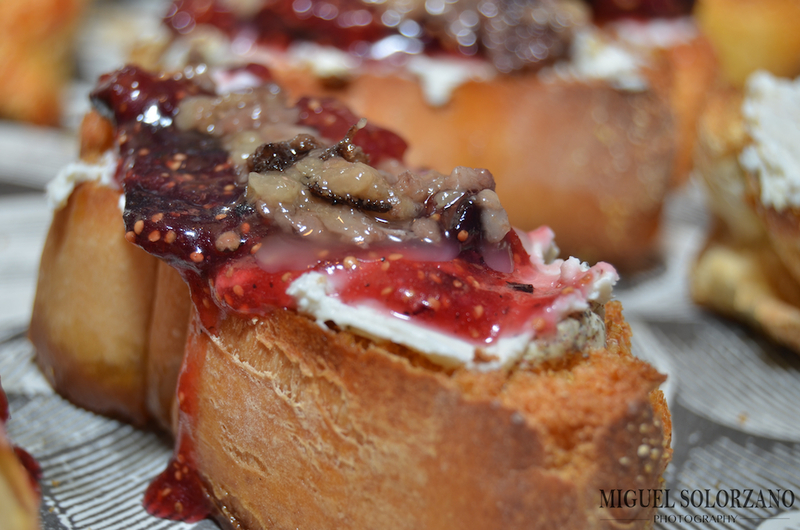 Once bread is toasted, fig jam has cooled and bone marrow has been extracted, prepare the toast by spreading goat cheese on first, followed by fig jam and top with roasted bone marrow. All these ingredients may seem like a weird combo. Hell, bone marrow itself may seem like a weird ingredient. But, I promise you this appetizer is decadent and full of flavor. I should probably actually jar some of the black pepper fig jam. To me, it and the bone marrow are the equally award worthy costars in this recipe for Bone Marrow on Toast with Goat Cheese and Black Pepper Fig Jam. WARNING: Prepare the following recipe with extreme caution. Symptoms of serving this recipe include: foodgasms, overeating, chip disappearance, double dipping, eyes rolling back and generally euphoria. Now that I’ve posted a full disclaimer, this is one of the best dips in the world. I was first introduced to Bob Armstrong Dip while eating at Mattito’s restaurant in Dallas. It’s not on the menu — something I full understand so the restaurant soundtrack doesn’t consist of When Harry Met Sally moments. Anyway, enjoy! 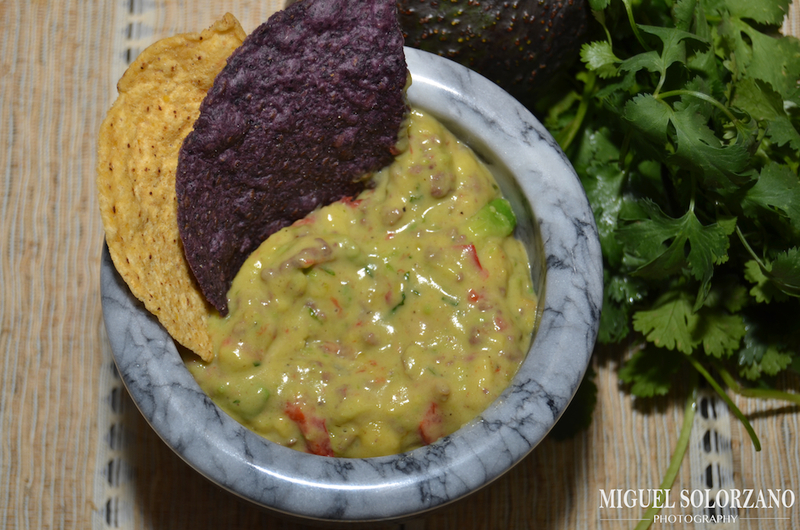 Bob Armstrong Dip is a combo of guacamole, chile con queso and taco meat. You’ll get a lot closer to Bob Armstrong Dip than this. 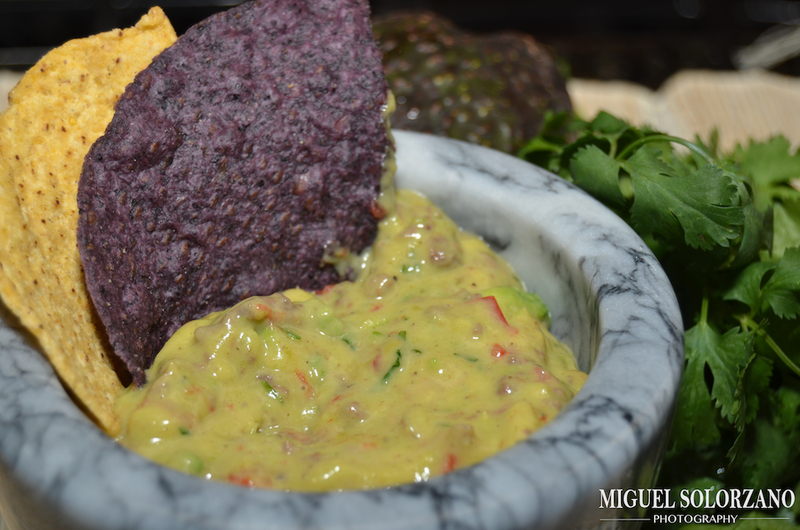 In a large bowl, mix together all guacamole ingredients and chill. In a large skillet, stir in bell pepper, celery, onion and spices from taco meat ingredients. Spread uncooked ground beef on top. Cook over medium heat until meat starts to simmer then break up meat and simmer on low for about 20 minutes. Remove from heat and set aside. Drain liquid from cooked ground beef and reserve for chile con queso. In a sauce pan, combine all ingredients for chile con queso except the cheese. Bring to a light simmer and gently simmer for about 5 minutes. Turn down heat and add cheese. Simmer until cheese is melted. Warm a 9×13 inch casserole dish or pan. 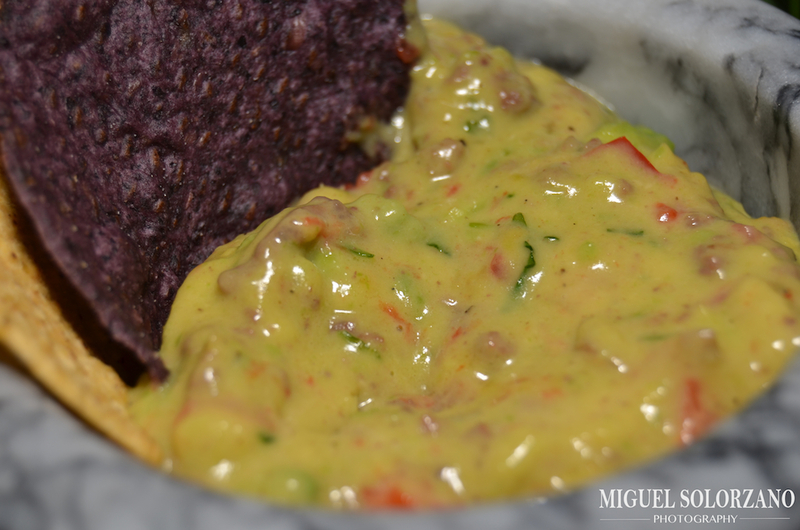 Spread guacamole into the pan, then add the taco meat, and top with chile con queso. Stir well to incorporate all ingredients. Serve with plenty of chips. To keep this Bob Armstrong Dip warm, you can place it in the oven at 250F. This is supposed to be served as an appetizer, but you may want to plan to serve it as an entree. It’s impossible to resist the dip known as Bob Armstrong Dip. Get ready to have your mind blown by this Tex-Mex concoction. It’s worth every bite. Looking for a vegetarian entree or appetizer that’s full of spice and loaded with nutrition? Look no further. 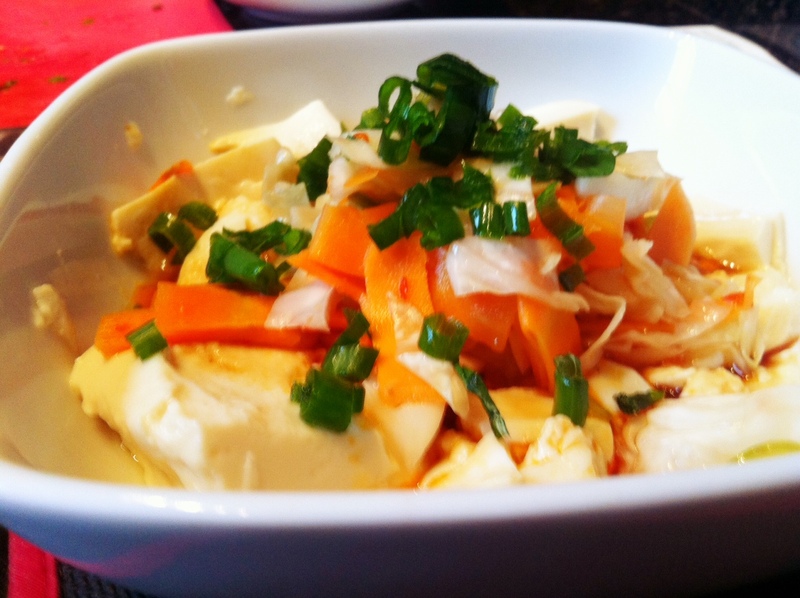 This recipe for Silken Tofu with Kimchi is delicious and takes about 15 minutes to make. 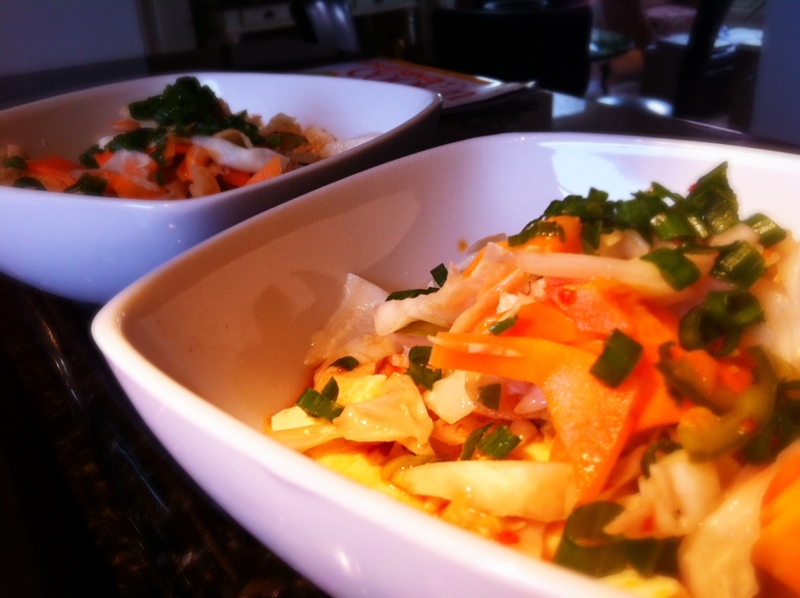 Kimchi is a Korean dish that’s a spicy blend of spicy peppers, cabbage and other Asian vegetables. I used storebought kimchi I got from our local Asian market, but feel free to make your own. Here’s a recipe. Boil a pot of water and add tofu and simmer until the tofu is warmed through. This should take about 5 or 6 minutes. Divide the tofu evenly between 2 bowls (or 4 if making as an appetizer). Drizzle each portion with half of soy sauce and half of chili oil. Divide kimchi evenly atop both bowls of tofu. Garnish with green onions and sesame seeds, then serve. I was surprised at just how much flavor is in this dish given the limited amount of ingredients and easiness to prepare it. The only problem is that I was left wanting more. While this can be served as an entree or an appetizer, it’s probably better as an appetizer as the portions are small. I chose to eat mine as an entree as I had a tennis match to play an hour later so I wanted something light. This Silken Tofu with Kimchi definitely fit the bill. This is one salad that’s perfect for Summer. It’s also full of healthy ingredients and won’t blow your daily calorie intake. 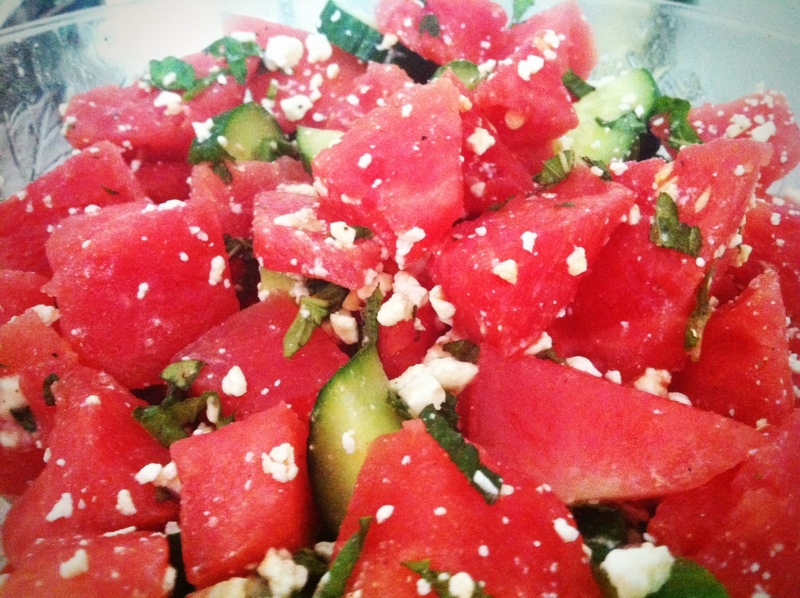 This Watermelon, Cucumber and Feta Salad is perfect for picnics, backyard barbecues and even a weeknight dinner. It has a nice crunch and even better taste. Plus, no cooking required! 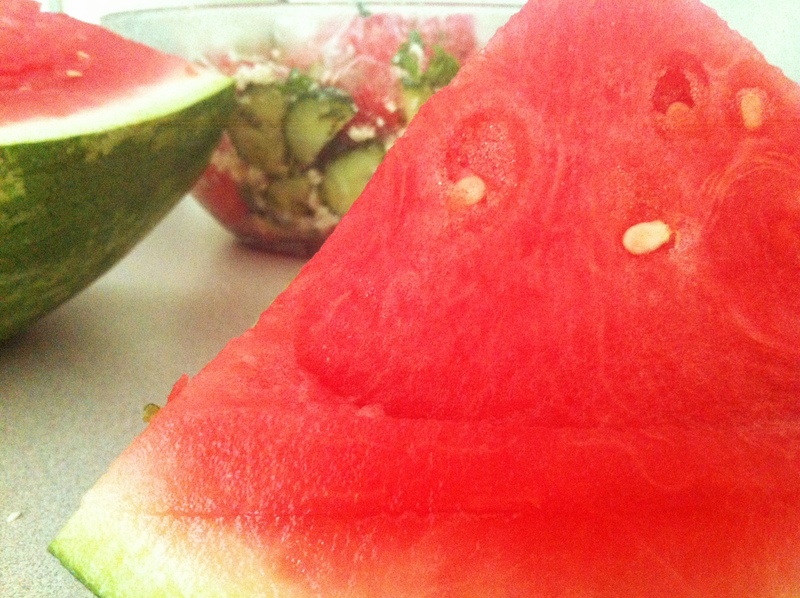 Watermelon is the quintessential fruit of Summer. Cut up all the fruit and herbs and mix in a large bowl. Add in feta cheese, salt, pepper and vinegar then toss well to mix. 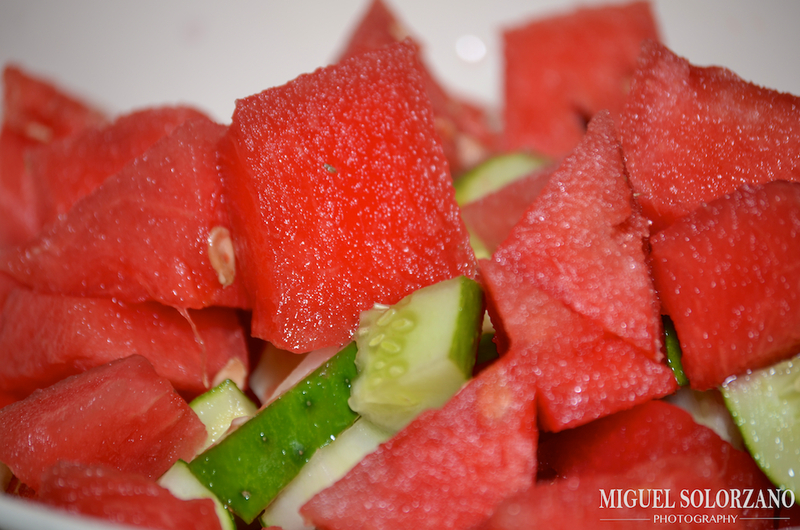 Watermelon and cucumber complement each other well. That’s it. Super simple, right? If virtually impossible to mess up. You can play around with the amount of herbs, salt, pepper and vinegar to add based on your taste preferences. I’ve found it doesn’t keep too well so I would eat it within two days of making. Otherwise, it gets a little soggy. It’s so good it’ll probably be gone in one sitting anyway. Honestly, I’m not sure I’ll ever post a recipe easier than this one. If you can’t make it, there may be no hope left for you in the culinary arena. Regardless of the difficulty (or lack thereof), this appetizer goes great with the bubbly which is a huge plus around New Year’s. Give it a try before 2012 gets here. 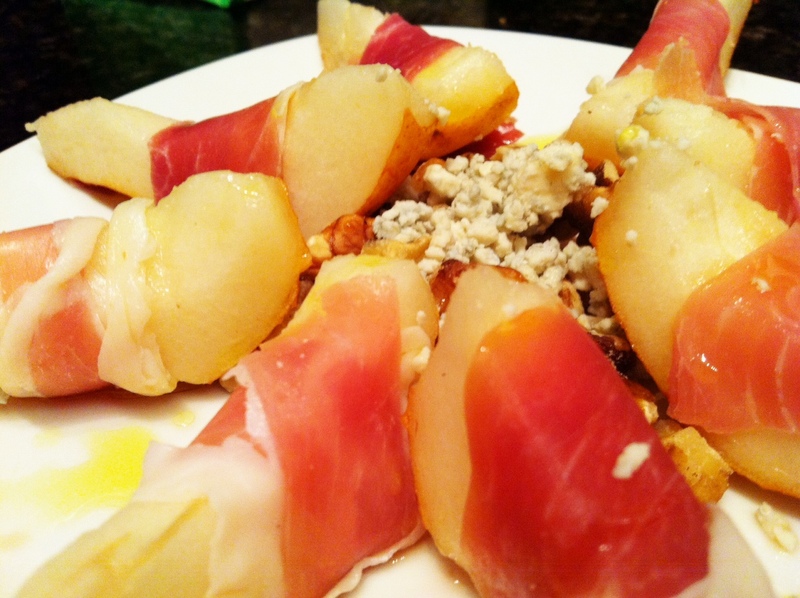 Wrap prosciutto around pear slices and place on a serving plate. Drizzle with olive oil and sugar cane vinegar. 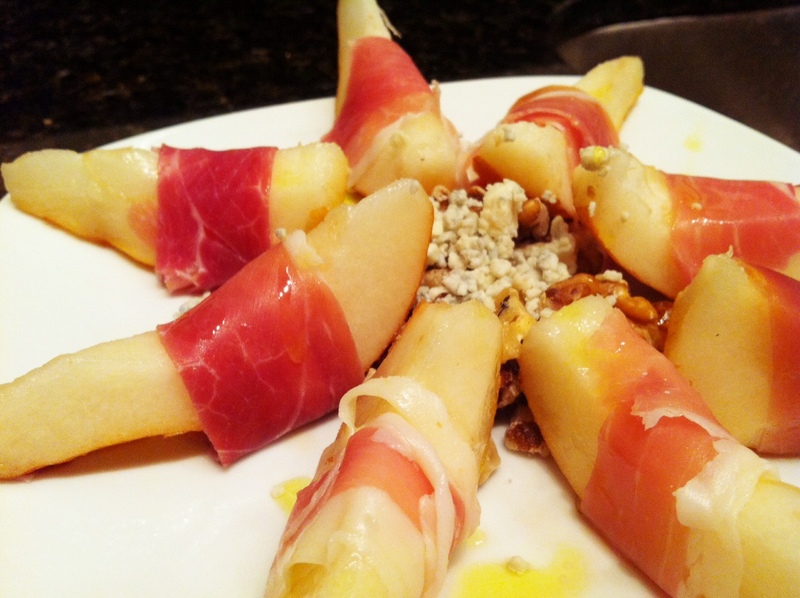 Aside from being super easy to make, these Prosciutto-Wrapped Pears have a nice savory/sweet combo working. They are appropriate for nearly any party. And like I mentioned earlier, they go really well with champagne. Cheers.